Turkey offers tourists a bit of nature and a touch of history. The Pamukkale Thermal Pools and Kaklik caves are natural wonders that you mustn't miss. And while you're there take a walk through history in the Amphi theatre built by the Ancient Romans. 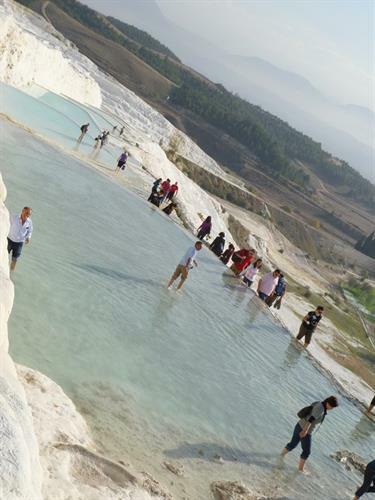 The actual translation of the word Pamukkale means cotton castle. It cannot get more obvious than that. The moment I heard about this amazing site with its thermal pools and mineral laden mud, I knew I had to see it for myself. The funny thing is I had been to Turkey before, but the thought of visiting the Pamukkale Thermal Pools never occurred to me until last year. I was just having a casual conversation over coffee about my trip to Istanbul, when my friend asked me about the thermal pools. He had a very puzzled look when I said I never got around to seeing them. That was when I got the notion I had definitely missed out on something big time. 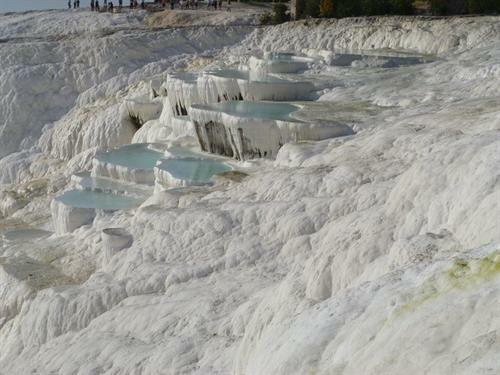 The Pamukkale travertine formations look very much like manmade structures, like a flight of stairs. However, these are naturally formed and it struck the ancient Romans with amazement, inspiring them to form a "spa town" here. It was in the 1980s that UNESCO declared it as a World Heritage Site. As I looked up stuff about it, my desire to see this natural wonder for myself was overwhelming, and I knew that I just had to take my family there, next year. So, last year when I took my family along to Turkey, we set up camp near Bodrium, and we arranged for day trips to Hieropolis and Pamukkale. We reached the spot at around 2 in the afternoon. It was so hot, I could literally smell my skin being scorched. Our package had included the entrance fee. 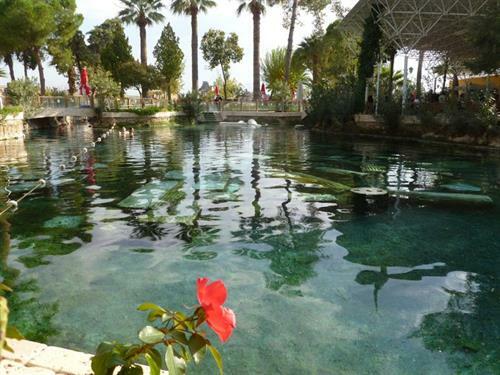 However, to gain access to the Cleopatras Pool, which is an extremely large thermal pool, you needed to pay an extra 32 TL. The pool was extremely warm, the carbonated water sliding over your skin, leaving large bubbles sticking on to you. I was advised against taking my kid, who was all of 10, in with me because you had to be clambering over rocky columns and jagged edges underwater. I don't think those were naturally there. It really was a surreal experience with the warm water almost giving you a whole body massage. You can spend as much time in the pool as you want, but once you get out, you have to pay the whole ticket price again to get back in. The whole experience was surreal, however, commercialization had done a bit of damage. The ambience was a bit disturbed by the gangs of photographers whistling and shouting at you, telling you to pose like this and that, so that they could sell the photographs back to you. We had plenty of options for a snack and nice shady spots to enjoy them. There was also the convenience of changing rooms, lockers, and showers for a deposit of 10	TL. I was told you cannot come to Pamukkale and not visit the Kaklik caves. It's kind of a small Pamukkale, but the main difference is that the whole structure is in an underground cave. 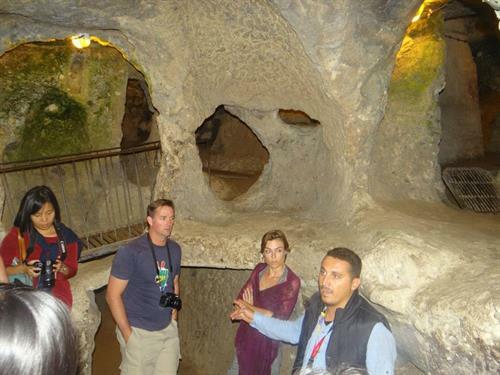 We paid 90 TL for the taxi ride from Pamukkale to the Kaklik caves. You have the same warm spring water cascading all around you, but the underground ambience makes it look like some fantasy island from a sci-fi movie. The kids loved it and we spent over an hour splashing in the pools there. The space is great for photos as it provides some amazing lighting options like nowhere else on the planet. 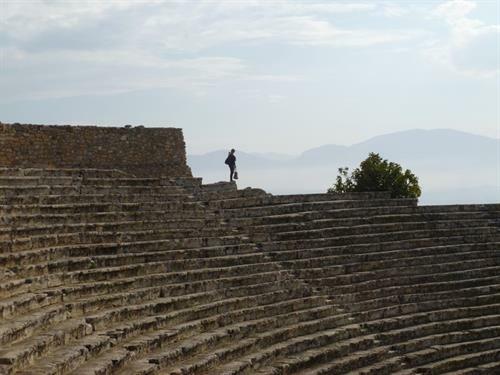 Another site of great historical significance near Pamukkale is the Amphi theatre and you cannot miss it, especially if you are a fan of ancient Roman architecture. Climbing up to the top is not very easy, but it is extremely rewarding if you take the effort to climb all the way up. There were people selling cold water at the entrance of the Amphi theatre, which was a great deal for me because I was thirsty like hell. Again, this is a tremendous photo op and I took my time taking pictures of the family. Everybody had a nice time. Going by my experience, I would advise that you visit the Amphi theatre first before going to the Pamukkale thermal pools, and then the Kaklik caves. It would help you to save time and feel less tired at the end of it all. The travelogue was a nice read. Heard about Turkish street food also is great. But, the current regime under Erdogen seems pretty conservative. How much expensive is turkey for a casual tour/visit?